Sound is something we use every day for basic communication and entertainment. It can be useful, enjoyable, and sometimes a necessity for survival. It can also be annoying and bothersome to our state of relaxation and concentration. But have you ever stopped to think what causes sound or how our ears interpret sound? If so, we have created a simple description to answer all of your questions! Picture in your mind a drum (or if you have a drum, use it!). Now imagine tapping on the drum. When contact is made with the drum, it causes the drum to vibrate. These vibrations move the molecules in the air. When the molecules move, they create sound waves. These sound waves are sent out in all directions. Check out this video on how sound works! Sound waves are created from vibrations of molecules. The volume of a sound is caused by the amplitude and the pitch of a sound is caused by the frequency of the sound wave. The amplitude and frequency of the sound waves can be affected by the source and energy supplied. For example, if you lightly tap on a drum the sound is quieter which means lower amplitude and frequency of the sound waves. 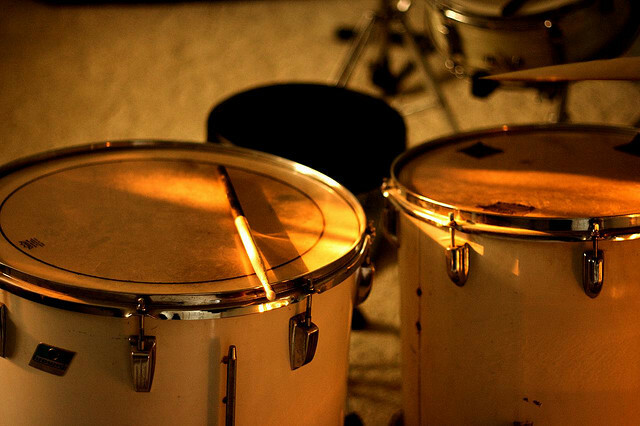 If you bang hard on the drum the sound waves will have higher amplitude causing it to be louder. Sound waves are sent in all directions from the drum. Some sound waves go directly to the ear of the listener and some bounce off of walls and other objects in the room before reaching the ear. Sound absorbers are used in rooms to absorb sound and reduce echoes. Sound diffusers are used to intercept sound and cause the waves to bounce in different directions so that the listener can hear the sounds more clearly. The ear is a very complicated organ in your body. There are tiny bones, tubes and membranes that allow you to hear sounds. To put it simply, when the moving molecules enter your ear, the pressure behind them causes the tiny bones to move. These bones make the eardrum vibrate which signals to your brain that there is sound. Read the article The Science of Sound and Musical Instruments for more details on the structure of the ear. Sound is blocked by adding heavy, dense layers between the source and the receiver. Since sound travels in the medium itself, soundproofing is further improved by adding dampening or decoupling layers within the barrier, such as air gaps. We talk about this more in our Ultimate Guide to Soundproofing your Apartment. If you are looking to reduce sound from coming into your living space from external sources, the AcousticCurtainTM soundproof curtain blocks up to about 90% of sound. The AcousticCurtainTM can be customized to fit your window or can also be purchased in the new standard-size.